One of our most frequently spotted winged residents is the Northern Cardinal (which happens to be the state bird of both our current home of North Carolina, and our original home state of Ohio). We have one cardinal couple in particular who likes to hang around our bird feeder. 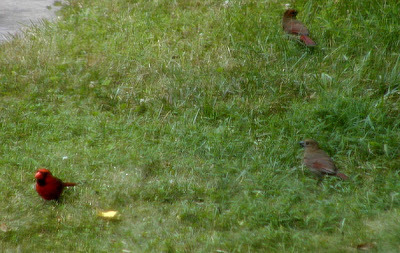 They’re mainly ground feeders, eating seeds under the feeder that other birds like our Tufted Titmice and Carolina Chickadees toss out. Why go to the trouble of picking seed out of the feeder when other birds do it for you, right? 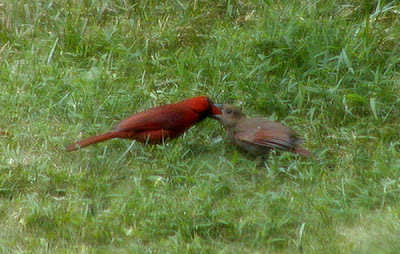 Today, papa cardinal came by and brought the kids for a lesson in “This bird feeder rarely goes empty thanks to some strange two-legged creature…she even throws seed right on the ground to make it easier for us to get.” As mama cardinal plopped down on a tree branch to supervise, the two young cardinals observed the male cardinal for a while and did some of their own seed gathering, then one of them got tired of that, threw a little tantrum and demanded a little assistance. 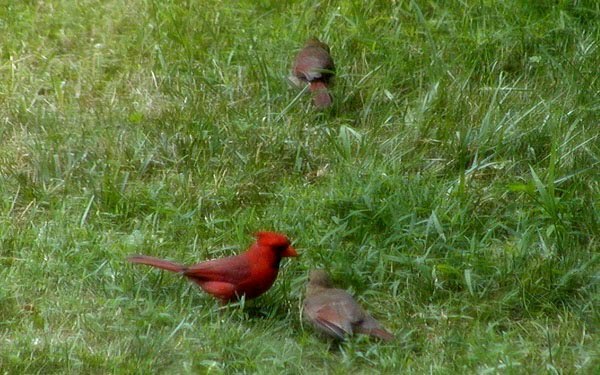 Birders are welcome to make an appointment to come out to the Inn for self-guided birdwatching opportunities. Simply e-mail us or call 828.668.1115 (we’re available by phone between 9:30am and 9pm daily). For more information about the North Carolina Birding Trail, visit www.ncbirdingtrail.org.